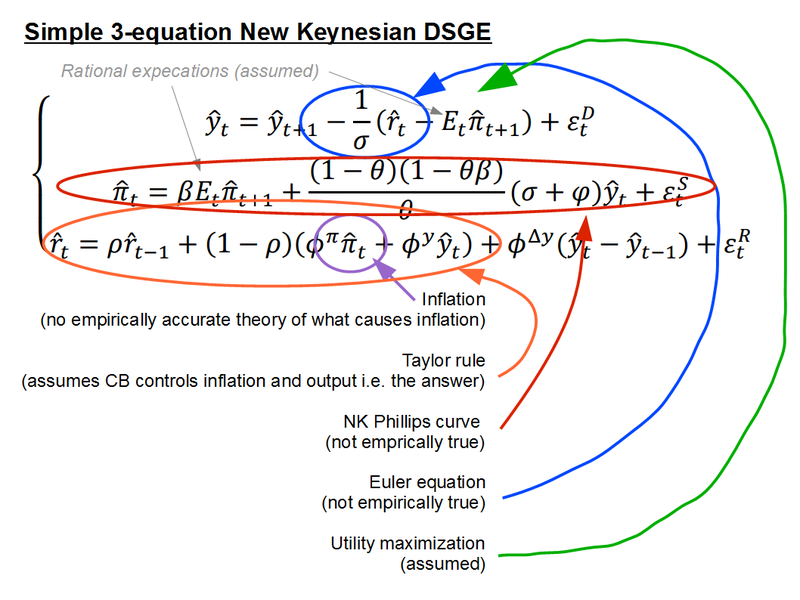 I thought of another way to drive home the point that DSGE macro is not like string theory. It's essentially another way of representing the Venn diagram in that post, but this time in terms of equations. Basically, string theory is built up from a bunch of very successful pieces of physics in a natural way. A DSGE model is built of a bunch of pieces that haven't been empirically validated or worse appear to be wrong. 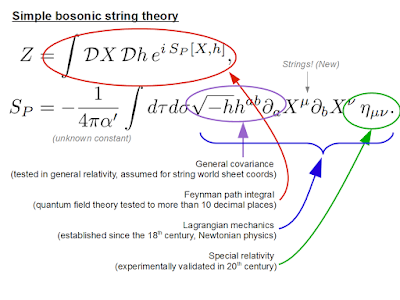 I show the path integral with the Polyakov action for the simplest bosonic string theory (that I grabbed from here [pdf]), and compare it to the simple three-equation New Keynesian DSGE model (that I grabbed from here [pdf] because it showed the equations in compact form). 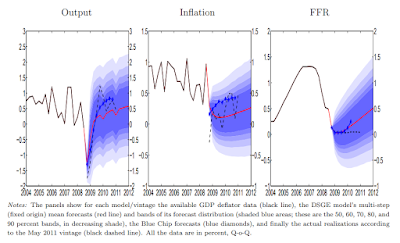 I had to stop adding problems to the DSGE model (e.g. intertemporal optimization). Theoretical frameworks organize well-established empirical and theoretical results. Using that framework allows your model to be consistent with all of that prior art. 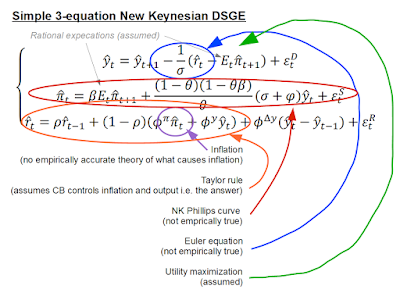 The string theory model encapsulated prior empirical success; the DSGE model does not. Frameworks are a kind of shorthand for testing new theories against the existing empirical data. 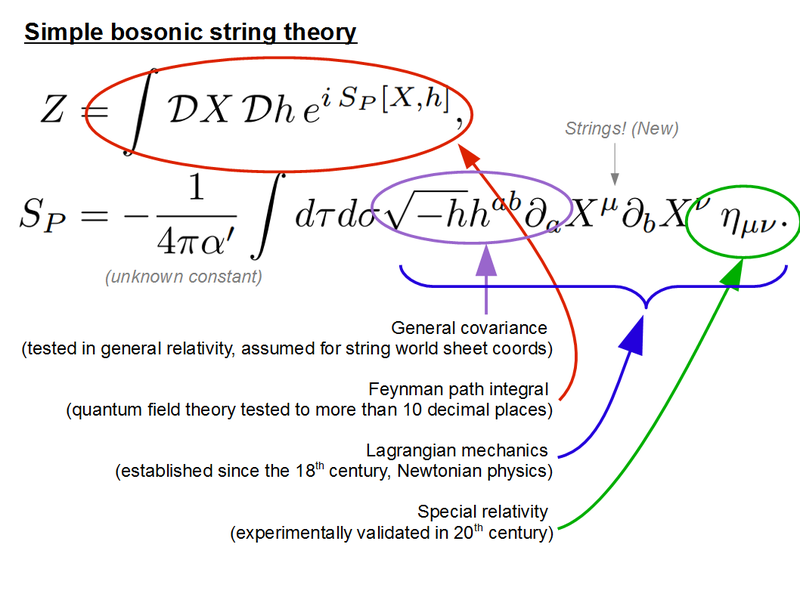 When the string theory Lagrangian uses special relativity or the path integral, it is going to be consistent with all the experimental tests of quantum mechanics and relativity. PS I put together that NK DSGE model as a series of information equilibrium relationships (and showed that there are better, more empirically accurate versions). O/T: What's your opinion on time? Is it "emergent?" If that question doesn't make sense, ignore (I thought I heard Sean Carroll mention that idea while drifting off to one of his lectures the other night). But generally I have no strong feelings about it. In a sense, the whole universe is emergent from nothing (I guess). I guess I suscribe to the Susskind/Bousso holographic approaches where most of our dimensions are emergent. In Verlinde's paper on entropic gravity, the direction of the gravitational field gradient is "emergent" (so "up" on Earth).